We have been using this oil, made by a local company in Byron Bay, for years now in our sessions and workshops. 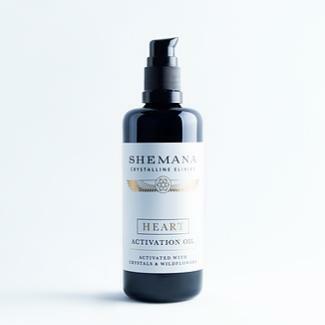 It’s a beautiful oil to use for breast massage supporting your connection to your heart, love and trust. It is solar infused with Lavender, Calendula, Chamomile and Rose Petal and is blended with delicate essential oils, nourishing botanical oils and a potent sequence of Crystal and Wildflower essences. It is designed to assist with emotional healing and openness. It comes in a 100ml Miron violet glass bottle and pump. Camellia Oil*, Sweet Almond Oil, Vitamin E, Jojoba Oil SOLAR INFUSION: Red Rose Petals*, Lavender*, Calendula*, Chamomile* ESSENTIAL OILS: Vanilla Absolute, Rose Absolute, Patchouli*, Lavender*CRYSTAL & WILDFLOWER ESSENCE: Rose Quartz+, Kunzite+, Pink Tourmaline+, Sydney Rose+, Little Flannel Flower+, Fringed Violet+, Red Suva Frangipani+.